September is gone and soon (not soon enough!) the sweltering heat and humidity and the lingering effects of Irma. Most of our membership only suffered the loss of power and the unrewarding task of picking up sticks. Others lost fences, roof corners and gained a pond in their pasture for a short period of time. All fixable. A collected sigh of relief. 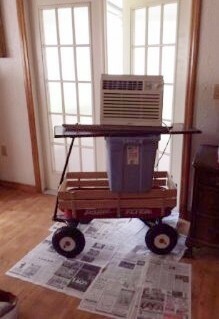 On the lighter side of a catastrophic event…those of us with a well-stocked trailer “glamped” in our garages, carports, wherever we could find shade and a place to run a fan. Some spouses were unaware of how much camping gear we have but they sure were thankful for it. A back pasture became a lovely place for a canoe ride, water troughs were great for baths. Creativity abounded on how to stay cool. Endurance riders know how to endure! 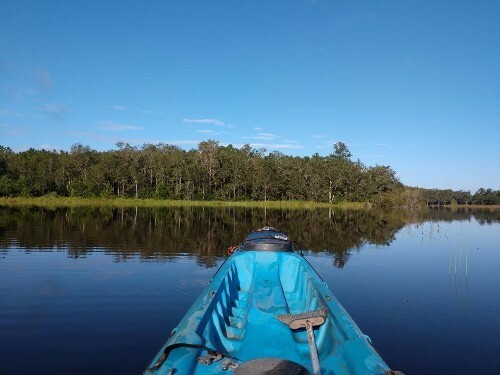 "Paddling the Marsh" The marsh is SEDRA member, Caren Risley's, back pasture after Hurricane Irma, 2017. Photo courtesy of Caren Risley. Don’t forget…Make sure your horse is getting the recognition they deserve too! They need to be signed up separately. The Equine Distance Nomination form is on our website. I CAN DO THAT! We would like to grow our mentors list. Are you an experienced endurance or CTR rider who can show a new rider the nuances of distance riding? Please contact Lindsay Campbell, our Education Chair at: vistalargo@aol.com to be added to the list. New to the sport? Check the list to see if a mentor is in your area. KUDOS! A big congratulations to our V.P. Lindsay Campbell on placing 2nd in the (PFHA) Paso Fino National Endurance Championship ride in Owyhee Canyonlands in Idaho. Getting back to 90 degree weather has been a tougher ride then the actual endurance event. Welcome home! We look forward to reading all about it soon. SKYMONT recap: Next year, do what you can to make this ride or at the least, put it on your “bucket list”. The Skymont Boy Scout Camp is tucked next to some of the most beautiful, challenging, and “Holy Mother of God” moment trails in TN. A technical ride with several steep climbs, twisty trails through forests, jeep tracks, rock paths, beautiful views and plenty and I mean PLENTY of rocks. 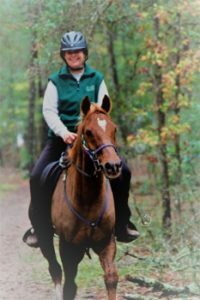 If you want to test whether you and your horse are ready for the Old Dominion, Leatherwood or South Mountain, this is certainly the place to do it. Trails were well marked, plenty of parking and a host of vets and volunteers make it all worthwhile. You’ll need shoes or boots for this ride folks. Thank goodness for the set of Renegades that were loaned to me after a local stated we could get by with just front shoes. NO YOU CAN’T! They also said the trails were “rolling”. If that was meant in terms that you’d be rolling off your horse when he takes the downhill at warp 10, then yes rolling they are! I hope to do it again next year after the pain of driving through Atlanta wears off. A HUGE THANK YOU to Deb Morse & Tom Winkle for their friendship and antics. CONTEST!!! 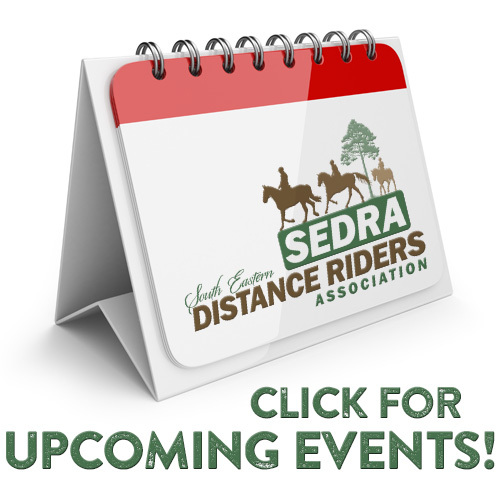 The SEDRA logo created in ca. 1984 is well loved and recognized throughout the Southeast but unfortunately, it no longer can be reproduced to today’s standards. With our current stock of logo items running low, now is the best time to update our logo. So… I had a thought, let’s open it up to our talented membership to create a new logo for us. The contest is open to all members and friends of members. Deadline for submissions is March 01, 2018. The BOD will look at ALL submissions and will bring the Top 3 to the Banquet for our membership to vote on. The Top 3 will be published on our FB and Web pages for everyone to look at prior to the membership vote. The WINNER will receive full recognition, 1 year paid membership to SEDRA and banquet, PLUS other fabulous gifts. All entrants will be recognized and thanked. The FHA 25 on October 21-22 is a CTR, Rookie Clinic and Judges Certification all rolled into one. The ride will be held from Doug & Michelle Shearer’s farm in Ocala, FL with direct access to the Florida Horse Park trails. Always a lovely ride, we encourage everyone to join the fun. This a great way to get a new horse started as well as new riders. There will be plenty of mentors available to help you if needed. Don’t be shy, just ask! Doug and a host of volunteers labored hard to get the trails cleared for the ride. Thank you to everyone who came out to help. The Autumn Gallop is now the Winter Gallop as Irma flooded Dunn’s Creek. The new date is posted on the calendar. Blackwater Boogie is always a great ride and one of very few that continues to offer distances over 50 miles. If you’re ready to tackle the next step in mileage, this is a great ride to do it at. I’ll be mentoring a first time 50 miler here on Indy. Yup, Indy. She’s game. I’ll bring her a beer for her breakfast. Join our Facebook page for informative articles and latest news events. Until we see each other again…Happy Trails! 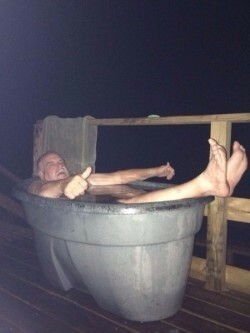 "Taking to The Trough" SEDRA member Mary Nord's hubby, Jeff, "cleaning up" and cooling off after Hurricane Irma, 2017. Photo courtesy of Mary Nord. "AC Architecture" Air conditioning creativeness at its finest during the aftermath of Hurricane Irma, 2017. Photo courtesy of SEDRA member, Linda Kropp.